Well, we need to face facts. 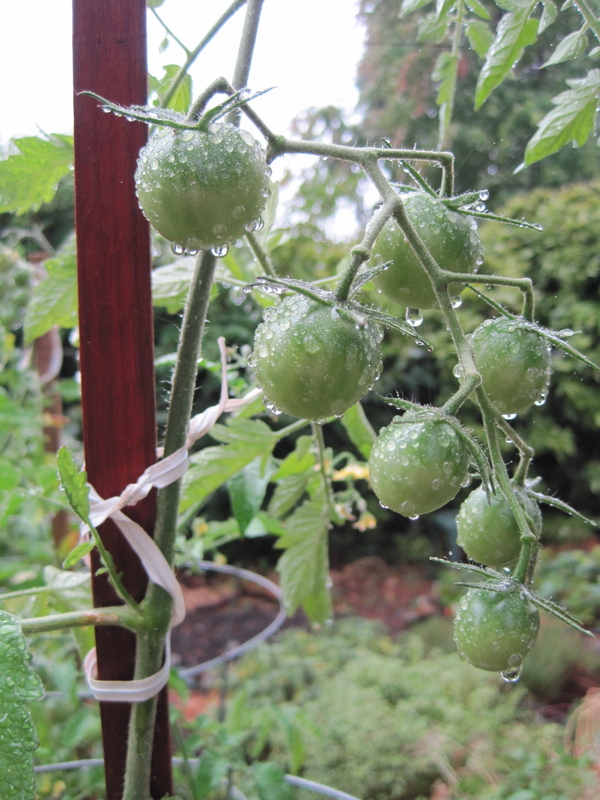 We may get a few more ripe ones during this warm weekend, but most of us in the Willamette Valley will be stuck with bushels of unripe tomatoes this year. Oven Roasted Green Tomatoes – slices of tomatoes, cookie sheet, brush with olive oil, salt/pepper and crushed garlic. Cook in slow, warm oven (200°F) for 4-6 hours till leathery. In a large glass or stainless steel bowl, layer tomatoes and pickling salt. Add cold water to cover. Cover and refrigerate for 12 hours or overnight. Transfer tomatoes to a colander placed over a sink. Rinse well with cold water and drain thoroughly. Peel, core, and chop apples. Add to vinegar to prevent browning. Tie pickling spice in a square of cheesecloth, creating a spice bag. Set aside. In a large stainless steel saucepan, combine vinegar and apples, drained tomatoes, onions, and green peppers. Bring to a boil over medium-high heat and boil for 30 minutes, stirring frequently. Stir in brown sugar and return to a boil, stirring to dissolve sugar. Reduce heat and boil gently, stirring frequently for 30 minutes. Add reserved spice bag and chili powder and stir well. Boil gently, stirring frequently, until thick enough to mound on a spoon, about 30 minutes. Discard spice bag. Sterilize jars, and prepare rings and lids according to safe practices (see canning book if you do not know how to do this). Ladle hot chutney into hot jars, leaving ½ inch head space. Remove air bubbles and adjust headspace, if necessary, by adding hot chutney. Wipe rim. Center lid on jar. Screw band down until resistance is met, then increase to finger tight. Place jars in canner, ensuring they are completely covered with water. Cover the canner, bring to boil, and process jars for 15 minutes. Remove canner lid. Wait 5 minutes, then remove the jars, cool, label and store in cool dark place. For best quality, consume within one year. 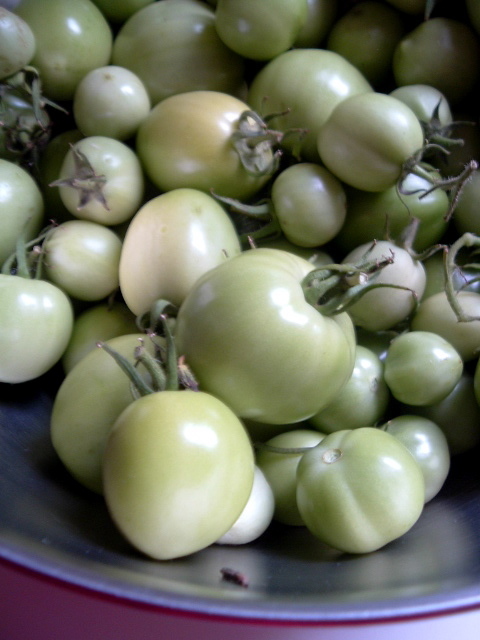 Ed note: because you can swap out tomatillos for regular tomatoes and green tomatoes for tomatillos in salsa recipes, according to Extension, I assume this means green tomatoes can be swapped out for regular tomatoes. Go, 9th grade math knowledge! Adapted from tomatillo salsa recipe in Extension’s “Tomatillos” publication SP 50-768. Reduce heat and simmer for 20 minutes, stirring occasionally. Prepare jars and lids. Ladle hot salsa into hot pint jars, leaving ½ inch headspace. Adjust lids and process in a boiling water canner for 15 minutes. Ed note: I make these green tomato sliced pickles each year. I find these work better than fermenting whole tomatoes, no matter how small they are, since I have not had great luck with flavor and texture (too hard and crunchy). Slicing tomatoes will slightly decrease the yield. Adapted from The Ball Complete Book of Home Preserving. Yield: 5 to 6 pints. Prepare canner, jars, lids. Keep jars hot. Yield may be smaller than 6 pints, but prepare 6 just to be sure. Slice or quarter your tomatoes. You may half smaller tomatoes. Keep cherry tomatoes whole. Try to separate tomato pieces by size, i.e., keep cherries together and slices together, for the best quality produce. In a large stainless steel saucepan, combine vinegar, water and pickling salt. Bring to a boil over medium-high heat, stirring to dissolve salt. Remove from heat. Add 1 clove garlic, 1 head dill, 1 teaspoon each of pickling spice and mustard seed to each hot jar. Pack raw tomatoes into hot jars to within a generous ½ inch of top of jar. Ladle hot pickling liquid into jar to cover tomatoes, leaving ½ inch headspace. Remove air bubbles and adjust headspace, if necessary, by adding hot pickling liquid. Wipe rim. Center lid on jar. Screw band down until resistance is met, then increase to fingertip-tight. Place jars in canner, ensuring they are completely covered with water. Bring to boil and process for 15 minutes. Remove canner lid. Wait 5 minutes, then remove jars, cool, label and store cool, dry dark place. For best quality, consume within one year. a collection of tested recipes from the Master Food Preservers. Thanks for all the suggestions. I’ve been eyeing my tableful of green cherry tomatoes trying to decide what to do with them. Some are ripening slowly but they seem to be softening up and I don’t think they will all make it to red and still be edible. I have red tomatoes slow-roasting in the oven right now and I wondered how green tomatoes would work. I’ll give your suggestion a try! I made these pickled green tomatoes a week ago. How soon can I dig in? Thanks for all the green tomato recipes. My neighbor just let me harvest 10 pounds of hers. I have a good Green Tomato Mincement recipe, if you’d like it. Gotta’ like sugar, though. But it does make a great mincement pie filling. I am curious as to how you use the “leathery” slow roasted toms. My mother canned Green Tomato Pickles evrry year, but I can’t remember how she did it. I know her recipe was not sweet at all, had dill and mustard seed and garlic. But she put in a lot of celery, green pepper strips and onion slices, too. I think this year i will try a bit of her recipe, a bit of your recipe, and throw in a couple cayenne peppers to boot and see how it all comew out.. Thanks for.at least getting me on the right track. PS: i know what you mean about the cherry tomatoes going wild this year. I had one plant that got 10 feet high and 16 feet across. That one plant has given me more tomatoes for juice than what i got out of my 14 regular.tomato plants gave me for canned tomatoes and salads. To Helen: i have seen several recipes say that you can eat pickles as.soon as 2 weeks after canning, but generally i have found it is better to wait 6-8 weeks for the full flavor to come out. My mother canned pickles this time of year every year, and shenmade us all wait until Thanksgiving before we could try them out 6-8 weeks). Hope this helps.